اشراقی آرانی, مجتبی, سلطانی, میلاد. (1396). اثر ورشکستگی شرکت‌های هواپیمایی بر مسافران و فرودگاه‌ها (مطالعه تطبیقی ایالات متحده و اتحادیه اروپا). پژوهشنامه حمل و نقل, 14(1), 184-199. مجتبی اشراقی آرانی; میلاد سلطانی. "اثر ورشکستگی شرکت‌های هواپیمایی بر مسافران و فرودگاه‌ها (مطالعه تطبیقی ایالات متحده و اتحادیه اروپا)". پژوهشنامه حمل و نقل, 14, 1, 1396, 184-199. 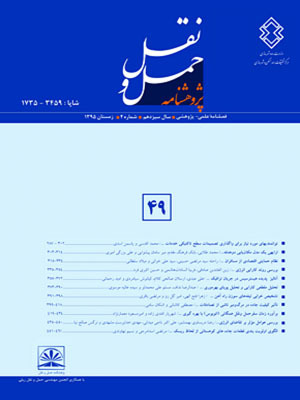 اشراقی آرانی, مجتبی, سلطانی, میلاد. (1396). 'اثر ورشکستگی شرکت‌های هواپیمایی بر مسافران و فرودگاه‌ها (مطالعه تطبیقی ایالات متحده و اتحادیه اروپا)', پژوهشنامه حمل و نقل, 14(1), pp. 184-199. اشراقی آرانی, مجتبی, سلطانی, میلاد. اثر ورشکستگی شرکت‌های هواپیمایی بر مسافران و فرودگاه‌ها (مطالعه تطبیقی ایالات متحده و اتحادیه اروپا). پژوهشنامه حمل و نقل, 1396; 14(1): 184-199. شرکت­های هواپیمایی­، بر هدایت صحیح این آثار راهکارهای لازم ارائه می­گردد. Airline companies due to the industry's own Hsasyt Hay economic issues such as the high cost of fuel prices, regional wars, and lack of seasonal demand from passengers, political sanctions and terrorism dumped into bankruptcy. In addition to these, the aviation industry, an industry which is considered expensive that owns a major factor in throughput is and difficult to administer these firms to be placed sensitivity. Hence the study of the history of the aviation industry, we have seen many bankruptcies. In the event of bankruptcy of an airline, the airline industry should assess its impact on the two basic elements occur. The passengers to serve as the main consumers of air transportation and airports as infrastructure, aviation Pillars. Assumptions such as that whether travelers are affected by this phenomenon? Whether the airline's bankruptcy effect on contractual relationships with airports and their economic performance. This paper seeks to answer these Assumptions and by demonstrating the impact of the bankruptcy of airline companies on the above, in addition to the emphasis on prevention of bankruptcy of airline companies, on the integrity of these solutions is necessary. - اشراقی آرانی، م. (1394)، "حقوق تامین مالی هواپیما"، تهران، شرکت سهامی انتشار، چاپ اول. - سلطانی، م. (1395)، "ورشکستگی شرکتهای هواپیمایی"، پایان نامه ارشد، دانشکده حقوق و علوم سیاسی دانشگاه خوارزمی. - Augustine, Antu. (2013), "WORLD’S LARGEST AIRLINES? ", Electronic copy available at: http://ssrn.com/abstract=2338566. - Baggaley, Philip A. (1998), "Assessing an Airline s Credit; The Rating Agency Perspective", in; Aircraft financing edited by little john, Andrew, and McGairl, Stephen, Third Edition, Euro money Books, London. - Borenstein, Severin and Nancy L. Rose. (1995), "Bankruptcy and Pricing Behavior in U.S. Airline Markets", The American Economic Review, 85, pp.397-402. - David Gillen, William G. Morrison. (2015), "Aviation security: Costing, pricing, finance and performance, Journal of Air Transport Management, Vol. 48, pp.1-12. - John F. Brown Company, Inc., (2003), Airport Case Studies in Connection with Study on the Impact of Air Carriers Emerging from Bankruptcy on Hub Airports, Airport Systems and U.S. Capital Bond Markets, Nov., at 98, http://ostpxweb.dot.gov/aviation/domav/dotspecterstudy.pdf. - Busse, Meghan. (2002), “Firm Financial Condition and Airline Price Wars", RAND Journal of Economics, 33, pp.298-318. - Kenneth D. Currie. (2012), “The Impact of Airline Mergers, Consolidation, and Bankruptcies on Airports and their Surrounding Communities, National Aviation System Planning Symposium, May. - Eilperin, Juliet. (­2002), "House Votes to Delay Guarantees; USAirways Calls Bill ‘Roadblock’ to Recovery", Washington Post, May 25 .p. E1. - Erwin von den Steinen، Ingomar Joerss، Pablo Mendes de Leon. (2009), "­Study on Consumer Protectionagainst Aviation Bankruptcy"­, 07 January,­ Prepared for: Directorate-General Energy and Transport European Commission, London. - Federico Ciliberto. (2012) " Bankruptcy and product-market competition: Evidence from the airline industry", International Journal of Industrial Organization, journal homepage: www.elsevier.com/locate/ij i o. - Graham Bowley. (2008), “Frontier Airlines Files for Bankruptcy", N. Y. TIMES, April 12, at www.nytimes.com/2008/04/12/business/12frontiercnd.html?ref=business (Last visited Dec. 16, 2015). - Gritta, Richard D. (1983), "bankruptcy Risks Facing the Magor US Airlines, journal of Air law and commerce, vol. 48. - Gritta, Richard D. (1972), "Debt Finance and Volatility in Rates or Return in Transport, Transportation Law Journal. - Jason Tolkin. (2010), "­Airline Bankruptcy: The Determining Factors Leading to an Airline's Decline", CMC Student Scholarship, CMC Senior Theses. - Jocelyn K. Waite. (2012), "The Impact of Airline Bankruptcies on Airports", available at http://nap.edu/23029. - Harold Dale Townsend. (2014), “Effect of Air Carrier Restructuring Strategies on Post-bankruptcy Performance", Dissertations and Theses, United States. - Hofer, Christian, Martin E. Dresner and Robert J. Windle. (2009), " The impact of airline financial distress on US air fares: A contingency approach", Transportation Research Part E: Logistics and Transportation Review, 45, pp.238-249. - Kristina McQuaid. (2007), "Delta & Northwest File for Bankruptcy: Is It Time to Ground a Major Airline? ", 29 HOUS. J. INT’L L. pp.663- 665. - Peter s. Morrell. (2011), "Airline Finance", ASHGATE, Third Edition, Cranfield University, UK. - Ray R. Sturm. (2010), “The Effect of Bankruptcy on U.S. Air Fares", macro think institute, Vol. 2, No. 2: E2. - Severin Borenstein, Nancy L. Rose. (2003), "Do Airline Bankruptcies Reduce Air Service?" NBER Working Paper No. 9636. JEL No. L1, L9. April. - Steer Davies Gleave. (2011), “Impact assessment of passenger protection in the event of airline insolvency”, March, Final report، European Commission DG MOVE DM24 Brussels B-1049 ، London. - . Trans World Airlines, (2010), Inc. "Company History." Web. 16 Oct.